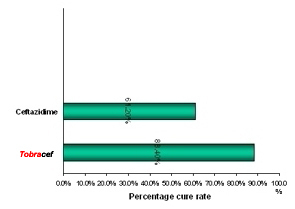 (7) Gynecological Infections Clinical Data Results of clinical Trials in Patients have shown better treatment or cure rate in patients receiving Tobracef (with new solvent) in comparison to Ceftazidime alone (Fig 1). Fig. 1 Results of clinical trials of Cetazidime-Tobramycin with NEW solvent in comparison with ceftazidime alone.